If you’ve ever had to explain to someone that iPhone visual voicemail does not literally mean video voicemail, you know the potential disappointment that comes with it. What the user probably envisioned was the ability to record a quick video message and leave that as a video voicemail for the recipient to watch when they receive it. But it turns out that the iPhone can send video messages, they just aren’t going to be labeled as voicemail or sent through FaceTime, and in some ways this makes them even more flexible. From the receiving users perspective, using “Message” will act closer to what a video voicemail may be like, with the recipient getting a notification alert informing them a video has arrived. These come in like a standard MMS, though there’s a small video icon in the lower corner to demonstrate that it’s a movie, and when tapped it plays the video. This is best with iMessage, so be sure iMessage is set up and configured for all users to get the best results. You can use email as well, though the video message will just be lost in their standard emails and it won’t arrive as a thumbnailed alert as the messages protocol does. Is this video voicemail? Not quite, but it’s pretty close. Hopefully a future version of FaceTime will allow for video answering machines and voicemail boxes, but until then, using iMessage gets the job done and should satisfy most users. 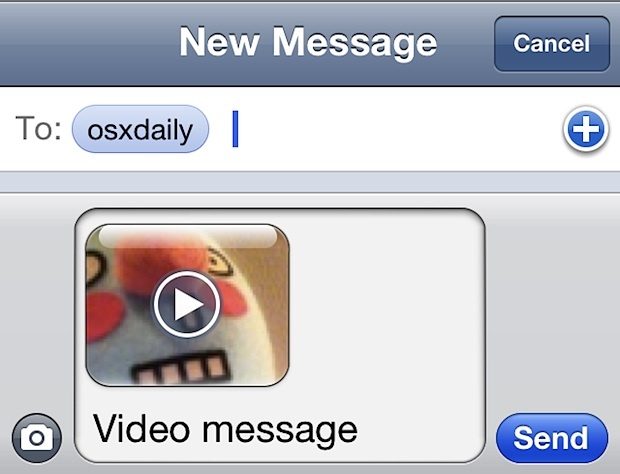 If you tap the camera icon within iMessage you can choose an existing video. Is using the front facing camera a requirement? What if you wanted a video of your cat doing something awesome and you doing a voiceover? Wouldn’t the rear camera be best then? Yes, I think this is just a use case for the ‘visual voicemail’ expectation. I ran into that with a friend a while back who was convinced their voicemail was broken because it wasn’t showing video of people talking, LOL. Rear camera has better resolution so it’s better quality, but the videos will be larger too. Depends on your data plan really, because without wi-fi it’s going to send over 3G. 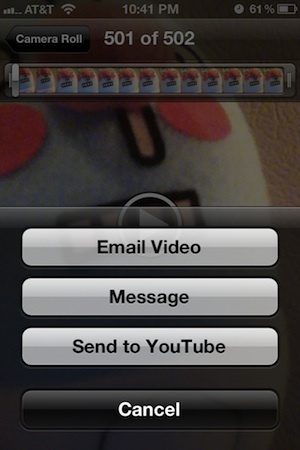 Is there any way to make the length longer than 30 seconds in order to send it via email or MMS? Yes you can record a video longer than 30 seconds and send it through email, though compression will reduce the quality of it. Try to send it over Wi-Fi too so you avoid using too much data. why not send the video message through whatsapp? You can send a longer message than through regular message or email.